With falling GMV in its Marketplace business, eBay is looking to advertising and classifieds for growth. In announcing 2008 financial results, eBay said for the full year, text and graphical advertising revenue was up 139%, StubHub was up 54%, and classifieds grew 57%. "These alternative ecommerce formats are increasingly giving us profitable, scalable and more diverse ways to monetize our traffic and connect buyers and sellers." Last July, eBay Advertising launched an international business division to service multinational campaigns, supported by a new advertising resource center (www.ebayadvertising.com) to showcase advertising opportunities. This week, eBay announced it had named Phillip Rinn its first director of advertising partnerships for the combined territories of UK, Ireland and pan-EMEA (Europe, Middle East and Africa). Phillip Rinn had been Director of Business Development at Shopping.com before moving to eBay International in 2007. He said of the appointment, "As the online advertising market matures, our goal is to make it easier for brands to reach an audience that's buying, searching and browsing specific products online, while pursuing additional revenues from advertising partnerships." Advertising is a touchy subject with sellers who pay listing and commission fees and find themselves competing with ads, something Yahoo recognized in 2005. When it decided to monetize its Yahoo Auctions site through advertising, it first eliminated all seller fees. AuctionBytes has documented the appearance of ads on eBay search results pages that promote products that directly compete with sellers' listings. eBay has since expanded the placement of ads. It has promoted its Kijiji classifieds website on eBay.com, sometimes displaying an invitation and link at the top of search results, and last year for the first time it placed advertising directly on product listing pages in Australia, Austria, Switzerland, France, Italy, and the UK. In August, Australian sellers were outraged when ads for the FoxTel digital television subscription service began appearing on their View Item pages directly below the "Place Bid" button. 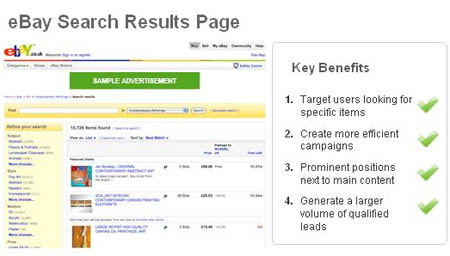 The options for ad placement are outlined on eBay's advertising portal page, and past placements are described in case studies. As eBay states, "Anything is possible - take a look through our strategic partnership case studies and see for yourself."